I have never been happier that we refused to allow my fourth grader to take the PARCC. Yesterday, I asked her what she’s heard at school about the PARCC tests her peers have been taking. Although she has never sat for a PARCC test herself, she was able to tell me that some of the 4th grade PARCC reading passages were from the Wizard of Oz (apparently one passage was about the Emerald City, and another told the story of the Tin Man). So in theory, if your child has not yet sat for the 4th grade PARCC, you could embark on a Frank Baum marathon this weekend to give your child a leg up on his or her upcoming PARCC test. This is one of the many logistics issues that has never made sense to me about the PARCC test security protocol: especially in the age of social media, how could the state departments of education and Pearson possibly have expected their testing materials to remain secret when one 4th grader might take the test as early as March 2nd, but that child’s cousin in another district might not be scheduled to take the same test until March 20th? Well, now we know. As you have probably heard, yesterday afternoon blogger (and former Star Ledger education reporter) Bob Braun reported that Pearson is monitoring children’s social media accounts to look for Tweets and other social media posts that allegedly compromise the security of its PARCC tests. Here in New Jersey, at least, when Pearson finds what it believes to be test-security infractions, it then tracks down those students’ personal data to figure out what schools they attend. Then Pearson reports the alleged infractions to the New Jersey Department of Education (“NJDOE”). As of yet, we parents have no idea if the NJDOE stores the report of this alleged infraction in its NJSMART database. What we do know is that the NJDOE has been notifying individual districts’ test coordinators of their students’ alleged infractions. Furthermore, we know that NJDOE has requested that the individual districts punish students for writing about test questions on social media. Today, Valerie Strauss of The Washington Post (yes, the same Valerie Strauss who graciously publishes many of the pieces I’ve written for this blog) confirmed the story, and obtained additional information from both the Watchung Hills Regional High School superintendent who expressed her concerns about the practice in the email published on Braun’s blog and from a Pearson spokesperson. The security of a test is critical to ensure fairness for all students and teachers and to ensure that the results of any assessment are trustworthy and valid. We welcome debate and a variety of opinions. But when test questions or elements are posted publicly to the Internet, we are obligated to alert PARCC states. Any contact with students or decisions about student discipline are handled at the local level. We believe that a secure test maintains fairness for every student and the validity, integrity of the test results. I think that Pearson, however, has missed the mark. First of all, what, exactly, is an “element” of a test question? Are the Pearson Police going to be at my doorstep tomorrow because I mentioned that I heard from my kid (who herself has not and will not sit for the test) that the 4th grade PARCC includes excerpts from Frank Baum’s work? And if I can’t — as I can’t — be held accountable for posting the tip above, why is it okay for Pearson, through its patsy, the NJDOE, to seek to impose disciplinary action against students who allegedly shared “test elements” (although not, according to the student’s superintendent, a tweet containing a photograph of the test itself)? Second, what does it mean for a test to be “secure”? Does Pearson really think that kids are not talking about these tests among themselves? Does Pearson really think it can bind our kids to secrecy? The last time I checked, our kids were minors — and therefore they, unlike their teachers, cannot be bound to a non-disclosure agreement even if it could be argued that our kids receive consideration in connection with these tests (and, my lawyer friends, even if there was consideration and such a contract could bind a minor, it sounds awfully like a contract of adhesion, anyway…). Along those lines: are our kids being instructed to keep the test materials secret? As a practical matter, it strikes me as pathologically naive to think that such instructions to kids could actually work. So if you think I’m mad about these tests now, Education Commissioner Hespe and Pearson’s Brandon Pinette, I better not hear that our schools are sending our children mixed messages by telling kids to be open with parents and trusted adults — except when it comes to testing. Third, what sort of people has Pearson hired to track children’s social media presences, and what steps has Pearson taken to ensure that its employees are properly vetted before it directs them to obtain personally identifiable information about our kids? Have Pearson’s employees been required to submit to background checks? It seems an odd person who would choose to make his or her living by delving into individual children’s social media use to the extent that the person can figure out the school the child attends. How are those people vetted? What steps has Pearson taken to safeguard our children? And should a private company, which is not subject to public oversight through OPRA, really be tasked with obtaining this sort of information regarding our children? Yes, it doesn’t shock me that Pearson, a for-profit corporation, is scanning our children’s social media, but it’s disturbing that Pearson is reporting the results of its social media monitoring of children to government agencies (presumably in return for the $108 million that NJDOE is paying Pearson to administer these tests). In particular, Pearson is reporting kids’ alleged test-security infractions to a government agency — the NJDOE — that maintains a database with a personal identification number for each and every public school student in New Jersey. Assuming for the sake of argument that our children are somehow precluded from freely sharing — either in conversation or via social media — the reading passages and questions asked of them on the PARCC, are we parents really okay with the NJDOE possibly noting our children’s poor judgment on their records of our children’s academic careers? I have no idea if NJDOE is tracking this information or not, of course — but then again, until yesterday I didn’t know that NJDOE was regularly receiving reports from Pearson about New Jersey children’s social media use either. It’s been a long time since I read Orwell’s 1984, but it really does feel like Pearson and the NJDOE expect parents to be okay with such corporate and government intrusion into their children’s lives. Maybe my opposition to this level of Orwellian intrusion is naive, but I, for one, find this level of intrusion into our children’s lives downright creepy. And I think that the New Jersey Department of Education officials who condoned this without full advance disclosure to the public should be summarily fired. David Hespe, that means you. Parents, if, until now, you’ve let your kids take these tests, remember: you can still choose to refuse. I began kindergarten at Millburn’s Deerfield School in the fall of 1978. From kindergarten forward, school was a place where I felt valued as a human being, and where learning was something that everyone around me took seriously. Even today, as a mother of two elementary school students myself, I look back on my Millburn education as the gold-standard of what a public education can and should be. I remember each of my elementary school teachers by name, and I can still recall many of the projects I worked on in their classes. As a mother, my Millburn education means that I know what public education can and should be. I now live in Montclair. After months of inquiry, I joined the PARCC-refusal movement as a protest against what the high-stakes testing culture is doing to prevent my kids’ teachers from engaging them the way that my Millburn teachers engaged me. I know the PARCC opt-out movement is popular, and I know the people who are part of it are only looking out for what they feel is their child’s best interest, so I do not blame them personally. But from the systemic perspective, opting out is a concept that cannot work. Even though it will be unpopular and will attract an aggressive reaction, somebody has to stand up and point out that the opt-out movement has to stop. It is just not a practical or viable approach to public education. Frankly, my kid (like most of her contemporaries in Millburn) will be fine whether she takes the PARCC test or not. I joined the test-refusal movement because the systemic pressure placed on public schools by high-stakes standardized testing must be stopped for the sakes of all of our children. We can and must do better by our kids, and if educational leaders like yourself are unwilling to step up to the plate, then we parents have no choice but to step in to preserve our vision of what public schools can and should be. Your editorial boils down to a slippery slope argument that misses the larger point of what the high-stakes standardized test movement is about. In addition, you conflate a broader category (assessment) with a far narrower subset of that category (high-stakes standardized tests). Indeed, within that logical fallacy, you also conflate the low-stakes standardized tests of the pre-No Child Left Behind days with the high-stakes standardized tests of today. Finally, you throw in a good dose of patronizing adjectives to describe your community’s parents (the loaded word “hysterical” used to describe a largely woman-driven movement is particularly egregious). [O]pting out of things with such broad brush strokes is different, and taken to its extreme, this new version of opting out will destroy public education as we know it today. If we don’t stop facilitating and/or encouraging all this “opting out” or “refusing” (or whatever it’s called), we might as well set up a la carte public schools. Your concern stems from refusal letters penned by some of your parents that not only refuse the PARCC test itself, but also refuse “anything to do with the Common Core.” I agree: that’s a silly position for a parent to take. But you are your community’s educational leader. To a large degree I’d posit that the blame for those inartful letters lies with you, as their leader, for not leading your community through conversation and consensus-building around community reaction to the PARCC tests and how Millburn could push back against state and federal edicts, especially considering that its reliance on state and federal dollars is relatively minimal. Instead, what I’ve been hearing is that at Millburn High School, your administration has been using Common Core to enforce lock-step curriculum on your highly-skilled and professional teachers. For instance, I’ve gotten confirmation from multiple sources that your high school English department now requires all teachers of the same course to teach the same lesson plans on the same day, which, to be frank, I find anathema to everything I valued about my own Millburn education. That’s leadership by fiat, which is a far cry from leadership through consensus-building in partnership with Millburn’s highly-skilled faculty. My jaw hit the floor when I first heard that story, and despite the multiple confirmations I’ve gathered, I still have a hard time believing it’s true. What it does tell me is how scared and beaten-down even Millburn’s teachers must feel, and that’s a tragedy for everyone involved with Millburn public education — especially the students. Next, your piece creates a straw-man argument by conflating two things that aren’t synonymous: assessment and high-stakes standardized testing. High-stakes standardized testing is indisputably one form of assessment, but not all assessment takes the form of high-stakes standardized testing. You then imply that parents who refuse PARCC are also refusing to allow their kids to be assessed by their classroom teachers. Your logic is again flawed. In point of fact, I have yet to meet a parent or teacher involved in the test-refusal movement who thinks that we shouldn’t assess kids. Indeed, I have yet to meet a parent or teacher involved in the test-refusal movement who thinks that teachers should not be allowed to test students. But as I’m sure you recall from your graduate studies (I certainly do from mine), assessment does not require testing, and certainly all tests need not be high-stakes tests used to punish schools, teachers, administrators, and students. You imply that parents who are refusing PARCC are also refusing to allow teachers to assess their students. Nothing could be further from the truth. During my years in the Millburn Public Schools, my work on each of the projects mentioned above was assessed by my teachers. I am sure that Millburn parents continue to welcome teachers’ feedback — at conferences, on report cards, and via grades on individual assignments — on their children’s growth as students. Your argument is, frankly, sad, and I would have expected more from the leader of the talented faculty who comprise the Millburn Public Schools. Similarly, you also conflate the low-stakes Iowas and similar norm-referenced standardized tests of yore (in my time, they were actually CTBS, not Iowas, but I digress) with the high-stakes HSPA, NJ ASK, and now PARCC that post-date No Child Left Behind. This argument not only conflates unlike things (the Iowa and CTBS type test scores were not aggregated and published to the community at large to be touted by real estate agents), but it is also disingenuous, as Iowa and CTBS test scores weren’t used as a potential basis to fire teachers and reconstitute or close schools. Unlike the post-No Child Left Behind criterion-referenced state-wide tests, the CTBS tests of my youth were low-stakes standardized tests, and thus were functionally distinct from HSPA, NJ ASK, and now PARCC. At most, the low-stakes standardized tests of my childhood were one factor among many used to place kids into gifted and talented programs. Finally, you characterize test-refusing parents as “hysterical.” As I am sure you are aware, the root of the word “hysterical” is in the Greek for “uterus.” Feminist scholars have analyzed how accusations of hysteria against women-led movements are a common means of social control exerted by straight, white men against woman-led social movements. I’m sure this was not your intent, and in fact I find real irony in your use of the word “hysterical” to describe the grassroots organizers against the PARCC given the nature of your own arguments, which truly are hysterical given that they rely on propaganda techniques such as the slippery slope and conflating similar terms. Nevertheless, your linguistic choice, although presumably unintentional, is patronizing and acts as an attempt to exert patriarchal control over a largely woman-led movement. As an aside, you can thank Dr. Cullen-Bender, my 7th grade Millburn Junior High School Communication Skills teacher, for my ability to identify, analyze, and reject the types of propaganda and false-logic techniques that form the basis of your editorial. 1. You mention some of your own concerns with the effects of high-stakes testing (e.g., that they take too long to administer, that they lead to problematic comparisons between district and schools, and, worst of all, that they’re inappropriately used to evaluate teachers). Those are many of the same reasons cited by the parents in your community for refusing the PARCC. I’d guess that along with those concerns, many of your local parents are also concerned that high-stakes testing in general — and PARCC in particular — is leading toward the same narrowing of the curriculum that led me as a Montclair parent to refuse to allow my daughter to be tested. What if, instead of fighting your parents over their legitimate concerns with the narrowing of world-class curriculum I benefited from in the Millburn Public Schools, you instead helped to lead the test-refusal movement, and in leading it, worked with your local parents to craft a test-refusal form that was limited to the specific issue at hand: high-stakes statewide standardized testing? In accordance with the district policy passed by our Board of Education last night, I am writing to notify you that I refuse to allow Elizabeth Blaine to take the PARCC test. Please let me know that you’ve received and recorded this note. In addition, please advise (at your earliest convenience) what alternative arrangements Hillside is making for students who refuse. As you know, our decisions is in no way a reflection on you or Hillside School. Rather, it is our attempt to stand with you and with Elizabeth’s teachers by refusing to allow student test scores to determine the fates of our teachers and our schools. You’ll note that there’s no muss, no fuss, and no slippery slope to complain about. 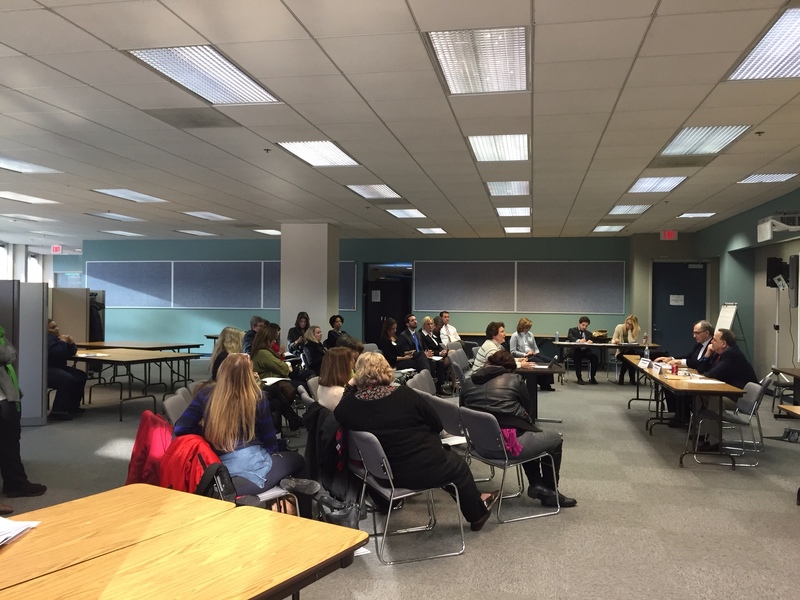 But that’s because despite our differences (and we have many over in opinionated Montclair), we were ultimately able to come together as a community to craft a refusal policy that respects our community’s legitimate concerns about the use of the PARCC tests. Millburn parents would have been far better served if you (or Millburn’s Board of Education) had done the same, rather than chastising them for the concerns that even you agree are legitimate. 2. What if, instead of drafting a poison pen op-ed criticizing your students’ parents, you instead led them in effective protest against PARCC and other high-stakes tests, as, for instance, Principal Carol Burris has done over on Long Island? Then you’d be controlling the message and ensuring that the PARCC refusals were limited to PARCC (and perhaps NJ ASK), rather than seeking to refuse everything under the sun. 3. What if you gave your students hands-on education in the democratic process by allowing them to participate — during school hours and of course on an elective basis — in the democratic processes aimed at reducing the annual high-stakes testing requirements by, for instance, lobbying their state and federal legislators in favor of bills like A-4165, A-4190, and A-3079 and a grade-span testing version of the ESEA reauthorization; attending and commenting at local and state school board meetings; and testifying before the NJ Assembly and NJ Senate’s Education Committees? Then your students would have the sort of real world authentic educational experience that they’d remember for the rest of their lives, even more than I remember the projects my Deerfield teachers created for me. 4. What if you had led your parents through consensus building and educating them about the issues facing public schools today (e.g., that the proper target of their anger with Common Core is activism at the state and federal levels, rather than local refusals) instead of berating them with your own “hysterical” slippery slope arguments (e.g., your “opting out will destroy public education as we know it today” argument discussed herein) against the straw-man of parents’ inartfully crafted refusal letters that include opting-out of Common Core curriculum as well as PARCC? Then you’d be able to gather data to show that parents in a town like Millburn want more for their kids than the narrowing of curriculum forced on schools, teachers, and communities by high-stakes standardized tests that diminish instruction in social studies and the arts. Then you’d be able to educate your parents about the real problems with decisions that have ceded educational policy making to the state and federal instead of local levels, and perhaps you’d be leading a grassroots movement to effectuate a return of education decision-making to the local level, where it can be carefully tailored to meet the individual needs of individual communities. You yourself note that there are precedents for opting-out of limited portions of the public school curriculum. You agree that those precedents have not “destroyed public education as we know it today.” PARCC refusal won’t — and shouldn’t — destroy public education either, as it, especially if narrowly-tailored by proactive education leaders, can and should be just as limited as refusing to dissect fetal pigs. PARCC acceptance, however, along with all of the high-stakes consequences that come along with it, might be the final nail in the coffin for local control of public education. I am not sure why Millburn’s educational leader, of all people, would quietly acquiesce in a scheme to remove the autonomy of Millburn’s overall excellent public school teachers and administrators, when he could instead have the courage of his convictions to speak out against it, like brave educational leaders (such as Carol Burris out on Long Island) have done. But you won’t build credibility unless you’re also honest about any degradation of the elementary school social studies curriculum, or other district-level choices, such as limiting electives and specials offerings, that you may have felt were no choice at all because of the pressures — especially in a town like Millburn, where test scores are a major component of identity and self-worth — to ensure that your students scored well on the test du jour. What I as a parent don’t welcome is feedback from a computer-based high-stakes (because it will, as you noted, be used to rank teachers, principals, administrators, districts, and schools) standardized test not tailored to what my child’s teachers have used their professional judgment to teach my child. I further object to forcing our professional teachers to tailor their teaching to such high-stakes tests, rather than allowing classroom teachers to design assessments of all sorts that best measure student achievement. If my child was offered low-stakes and norm-referenced standardized tests once or twice during her educational career as a check-in (such as the CTBS tests I recall taking in the 4th grade at Deerfield and in the 8th grade, I think, at the Junior High), I’d welcome that feedback as two data points among many. But the “feedback” from the PARCC, which will, as you note, be used inappropriately to rank teachers, schools, and districts, is not worth the price. It’s too bad that you can’t see the distinction, and that you’ve instead chosen to lead your community by going public with a slippery slope argument that fails to draw a distinction between teacher-created in-class assessment and statewide high-stakes standardized tests. Perhaps Millburn would have been better off if you could have benefited from the critical thinking required by an old-fashioned Millburn education? As a test-refusing parent, that old-fashioned progressive Millburn-style education is all I want for my kids. 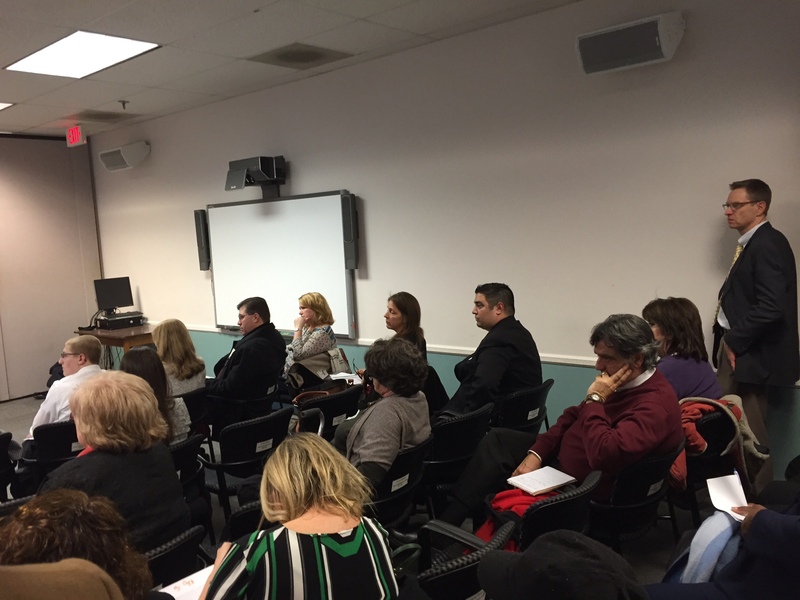 For those who don’t recall, on October 30, 2014, then Acting Commissioner Hespe issued guidance to school districts and charter school leaders in which he suggested (but did not require) that they institute punitive measures in an attempt to squelch New Jersey’s opt-out/test refusal movement before it got started. Hespe’s guidance backfired. Instead, he just pissed me — and countless other New Jersey parents — off. 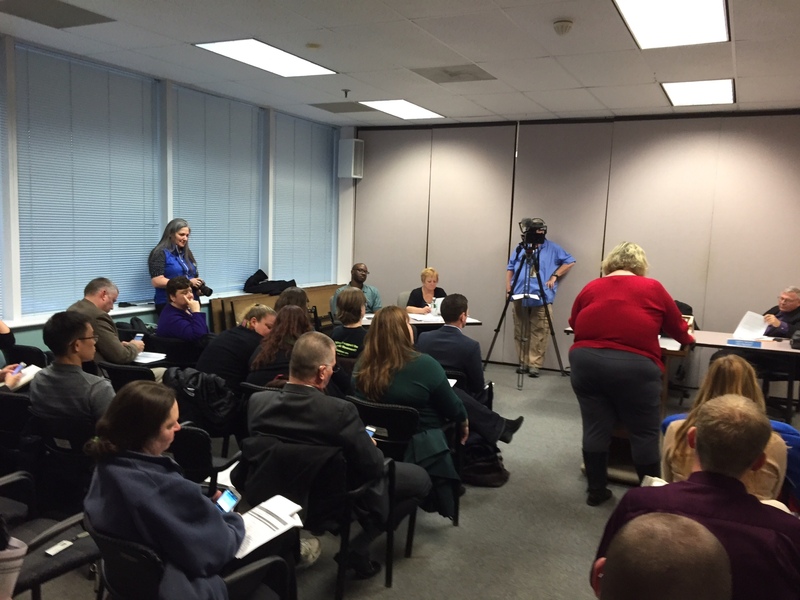 Today was our first chance to publicly speak out to Hespe’s sort-of bosses, the New Jersey State Board of Education (Hespe’s real boss is Governor Chris Christie, and there is no doubt in my mind that regardless of what the NJBOE does next, Hespe will continue to dance to PARCC’s tune until Governor Christie tells him to change course). I arrived at around 10:40 this morning. The presentations to the Board were already in full swing, and the room was so full that I couldn’t even get standing room, so a friend and I waited out in the hall. The crowd continued to grow. I believe that 96 people were signed up to speak, but although a few speakers didn’t show, there were plenty of other non-speaking parents, teachers, community activists, and local school board members who had come to listen and/or show their support. 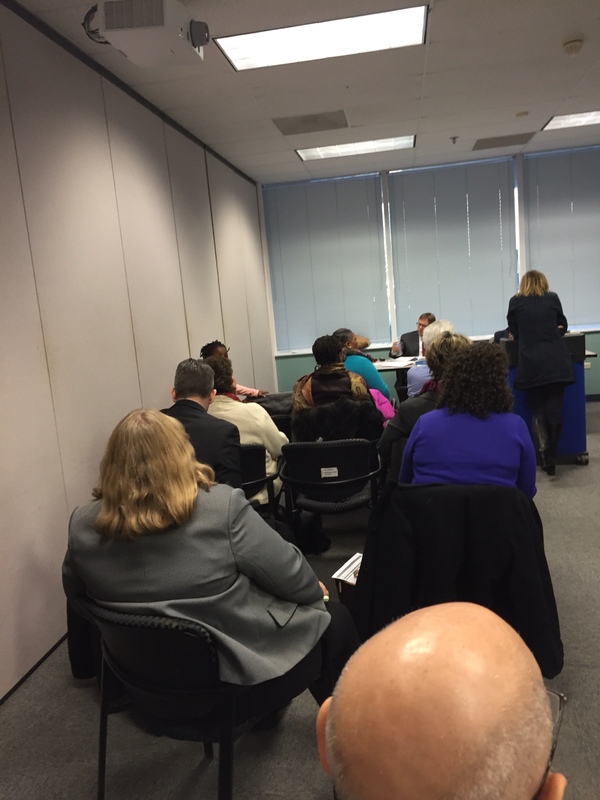 Unfortunately, NJBOE’s protocol is to divide public comment speakers among four different rooms, and to assign 1-2 NJBOE members to listen to comment in each room. Although this is far more efficient in terms of time (even then, there’s a 5 minute time limit, but enforcement was much less draconian than enforcement of the 3 minute time limit at our local Montclair Board of Education meetings), it’s unfortunate that the press, fellow attendees, and Board Members themselves do not get to hear more than a small sample of the total comments presented. Intentional or not, this diminishes the power of a large turnout of parents almost universally united around a common issue (here, opposition to PARCC and similar high-stakes standardized testing). 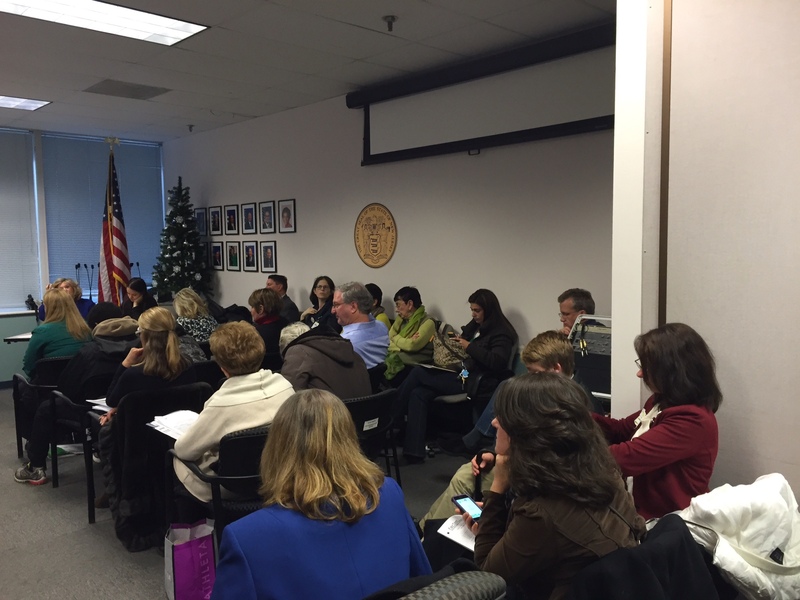 As you can see, among the four rooms, there were a LOT of citizens, most of whom, like me, took a day off from work because we think it is important that the NJ State Board of Education hear from parents and students about the mess the PARCC is creating in our schools. I don’t have accurate numbers, because many people came to be supportive without speaking, but I’d guess that the turnout easily exceeded 100 people. Perhaps the most gratifying part of the event for me personally was to hear from the half-dozen or so children who’d come to testify. Almost all of them told me that they’d been inspired to come testify by my daughter Elizabeth Blaine’s public comment to the Montclair Board of Education a couple of weeks ago, which I haven’t mentioned also led to us getting interviewed (to my enduring political chagrin, but it’s nice that we have common ground on something) on Fox News’s Fox & Friends morning show. Just in Room C, we heard from a 10 year old girl, a 7th grade girl, and a 9th grade boy. All three were opposed to PARCC and the related test prep. It was also terrific to get to meet — in person — many of the fellow New Jerseyeans I’d only connected with virtually through our shared opposition to these tests. I’m only sad that because of the four-room set up, I didn’t get to meet a number of other terrific leaders that I know were there. 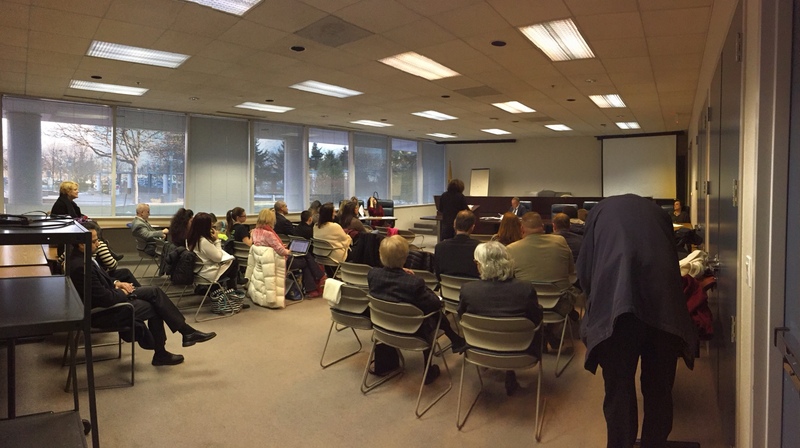 But the major takeaway from today is that there is a strong — and rapidly growing — PARCC refusal movement in New Jersey. And it was great to see members of the press, from the pieces that already appeared on the Star Ledger and the Asbury Park Press website to the appearance of reporters from NJ101.5 to The Alternative Press – Edison (and there may well have been other reporters I wasn’t aware of). Go readd the Star Ledger and Asbury Park Press articles: their reporters didn’t pull any punches today. The bloggers were out in full force too. Here’s a piece from Marie Corfield that contains some stunning news: following the comments he listened to today, the President of the NJBOE apparently stated publicly that they know that they can’t force kids to take this test. I’ll add more blog links as I come across them. Take note, Commissioner Hespe. You declared war on the parents and students of New Jersey back in October, but we are organizing, we are rallying, and we are fighting back. I did note, however, that you were too cowardly to sit in any of those rooms to hear for yourself what the parents and students of New Jersey are saying. I heard from more seasoned activists that this was par for the course from you — you apparently don’t deign to bother with public comment. That’s all part and parcel with the CCSS/PARCC playbook, of course, which generally fails to prioritize democratic values. I don’t think your disappearing act gives you cover to continue claiming that New Jersey doesn’t have a growing opt-out/test refusal movement. Watch out, Commissioner Hespe: this is one war we’re going to win. Finally, Governor Christie, with your PARCC study commission that has not yet publicly released the preliminary report that was due on December 31, 2014, don’t think your teflon governor act is going to allow you to escape blame for imposing PARCC and Common Core on the people of New Jersey. Trust me, from the brief foray I made into the world of Fox News, your national base isn’t impressed with your Common Core and PARCC cheerleading. Your national ambitious may well hang on this issue. We lefties won’t rally behind you on this either. Ironically, Governor Christie, through your minion David Hespe, you are a uniter: you are uniting the left and the right, the rich and the poor, the white and the black, the native English speakers and the English Language Learners, in shared opposition to your market driven education reform policies — including, but not limited to, your imposition of PARCC onto the people of New Jersey. It was a powerful thing to watch as the wealthy and privileged parents from Basking Ridge made common cause with parents from Newark. We don’t resemble each other in race, socioeconomic status, or political affiliation. But one thing was clear: no matter what our backgrounds, none of us want you to dismantle our public schools. And we all agree on one thing: education is a necessary ingredient for democracy. A policy aimed at dismantling public schools is a policy aimed at devolving democracy into demagoguery. We won’t forget. And we won’t — we can’t — let you win.